The Rocket Man and Your Song star is to be given the Brits Icon Award at a show in September which will be broadcast later by ITV. The new prize - created by the BPI, music industry's trade body - will stand alone from the main Brit Awards each year and will be presented to a notable artist whose writing, recording and performances have made a "lasting impact on the nation's culture". 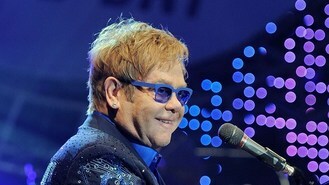 Sir Elton has recently been treated for appendicitis which resulted in his shows being cancelled including a headline appearance at Hyde Park this month. But he is expected to be recovered by the time of the event on September 2 at which he will perform and welcome a number of guests. The chart veteran, 66, will be inducted as a Brits Icon at the inaugural event in central London on Monday 2 September 2013, which will be filmed for broadcast later in the month on ITV. Tickets for the show - at which he perform classic hits as well as songs from forthcoming album The Diving Board - will go on sale on Tuesday at 10am, with proceeds going to the Brit Trust and the Royal Academy Of Music, at which Sir Elton trained. He said: "It's a tremendous honour and a real thrill for me to have my work acknowledged in this way, and I'm really looking forward to participating in what promises to be a very special occasion." A number of tickets for the evening will be available for sale to fans from 10.00am on Tuesday 23 July 2013 at www.brits.co.uk and www.seetickets.com. Together with the music industry charity The Brit Trust, one of the show's beneficiaries will be the Royal Academy of Music, where Sir Elton trained before embarking on his amazing career. The BPI and Brit Awards chief executive Geoff Taylor said: "The Brit Awards has recognised many exceptional artists whose music has connected with millions of fans. A few of these artists, such as Sir Elton John, have achieved such a level of artistic creativity and originality, critical acclaim, global recognition and popular success that they deserve to be recognised as true icons of our cultural life."